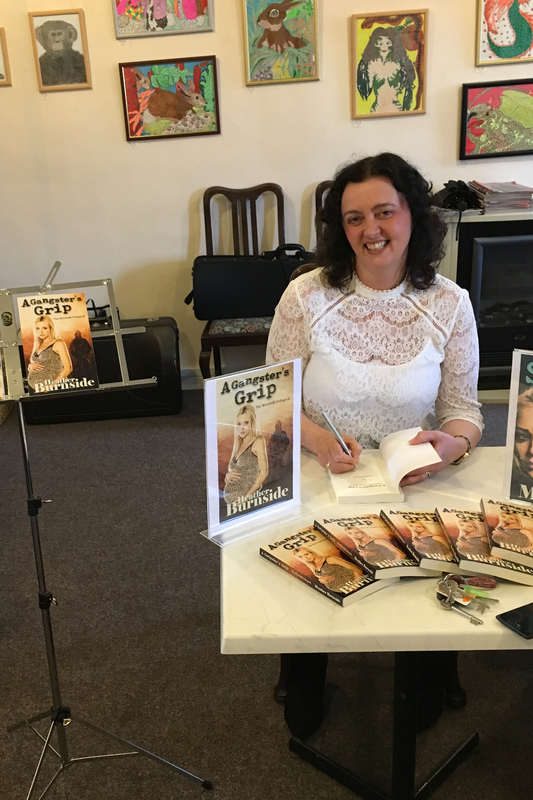 On Saturday 24th October I held my book signing event for my second novel, A Gangster’s Grip at Thackeray’s Books in Denton, Manchester. 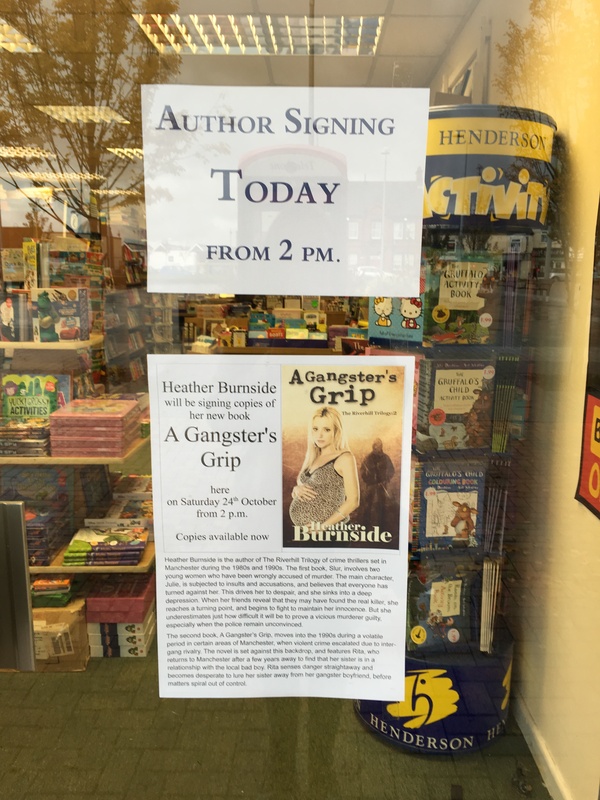 The shop’s proprietors had prepared an excellent window display in advance of the book signing, showing the cover of ‘A Gangster’s Grip’ and giving the background to both of my novels. Apparently the poster had attracted interest and positive feedback from customers in the days preceding the book signing. We arrived fifteen minutes early to find that we already had a customer waiting, and we still had to set up the table and display. My wardrobe malfunction didn’t help matters and, as more customers arrived, I struggled to free my lacy blouse, which had become entangled in my necklace. (This is not exactly the professional image you want to project to readers. 🙂 ) A valuable lesson was learnt and I think that in future it would be advisable to arrive half an hour before the signing. Fortunately the customers were very patient, and the convivial atmosphere at Thackeray’s helped. Book signings are held in a room above the bookshop, which is also a tearoom selling home-made pastries and housing art displays from local authors. As well as people who had attended my previous book signing for Slur, there were some new faces. It was great to meet new readers and chat about my books. One thing I did underestimate was how many copies of my previous novel, ‘Slur’ I would need. Because ‘A Gangster’s Grip’ is the second book in a trilogy, readers who hadn’t already read ‘Slur’ wanted to start with that one first. Some even bought both books. Another valuable lesson learnt for future signings is to stock up on print copies of all my books. I have now sold out of my author copies of ‘Slur’ and emptied Thackeray’s shelves of all copies too, although the book can still be ordered online from Amazon. N.B. I’ll be restocking as soon as possible. Despite a couple of minor hiccups, it was a successful afternoon, and a wonderful opportunity to engage with readers. Although readers can get an idea of what a book is about by reading the blurb and glancing through the first few pages, they enjoy meeting authors and finding out a little about the background to novels. Book signings give readers a chance to do this and also enable authors to build up a local following.